As a recent college graduate and a full-fledged twentysomething, I sometimes find myself drowning in nostalgia about my beloved university. The University of North Carolina at Chapel Hill (my alma mater and the greatest university in the world…but I digress) has changed my life in more ways that I can even count. There is something equally exhilarating and terrifying about graduating from college and taking your first steps into the real world. There’s the freedom to begin living life on your own terms coupled with the responsibility of knowing that course of the rest of your life rests solely in your hands. For me, college was the perfect time to learn who I was and experience life in a whole new way.I wrote the following a couple of months ago and it still sums up perfectly how I feel about leaving the comforts of undergrad and entering this next phase of my life. The last four years have gone by faster than I could have ever imagined. I still remember stepping onto campus for the first time, overwhelmed by the vastness of this unknown town. I was afraid: afraid that I wouldn’t survive away from home, afraid that I wouldn’t make new friends, afraid that I would fail my classes, afraid that I would NEVER learn my way around. Change scared me – it’s always scared me – and I initially shied away from the challenge of conquering this new terrain. Now, four years later, August is right around the corner and it’s slowly sinking in that I won’t be returning to the safety and serenity of my beloved Chapel Hill. I won’t be fighting through the crowds on South Road at Fall Fest, determined to get free pizza even if it killed me. 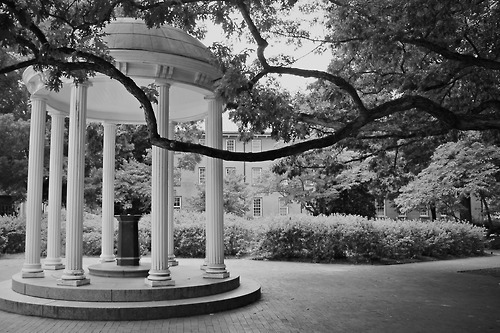 I won’t be sitting in Polk Place for sunset serenade, swaying with my fellow Tar Heels as the Clefs welcome the dawn of a new school year. I won’t be setting new records for how fast I can get from one corner of campus to another to catch the bus home. I won’t be visiting Alpine Bagel so often that they memorize my order. I won’t be screaming my head off in the stands at football games or entering basketball lotteries in the vain attempt to get tickets. I won’t be wading through the Pit on rainy days trying to get to class on time. I won’t be spending late nights in Davis Library trying to finish a paper or study for a test that I pushed off until the last minute. All of the memories are just that now. Memories. And it hurts. 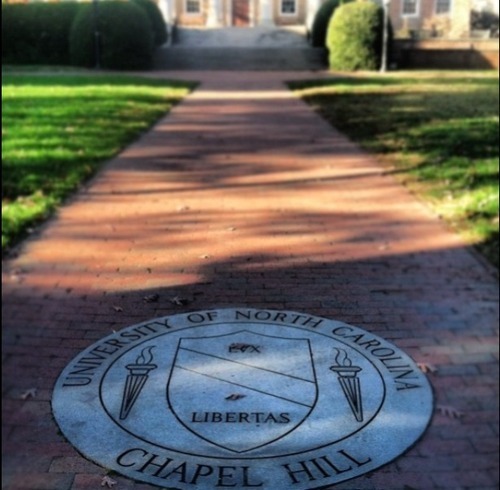 It hurts because Chapel Hill has given me more than I could have ever asked for. I’ve been taught by world-class professors in a variety of subjects. I’ve experienced school spirit unparalleled by any other university in the country. I’ve met people from all walks of life and made some of the most incredible, life-changing friends. I’ve seen the sun set over Polk Place and the flowers bloom around the Old Well. I’ve learned so much about myself and I’ve learned how to be comfortable in my own skin. Somewhere between Franklin Street and Manning Drive, I found my voice. I don’t know where the next chapter of my life is going to take me…and I’m afraid. Afraid that I won’t survive away from home. Afraid that I won’t make new friends. Afraid that I won’t learn my way around a new city. Afraid that I don’t have what it takes to be successful. But I’ve had these feelings before, and a quiet little town gave me the confidence to face the world head on. So thank you, Chapel Hill. For your safety. For your love. For your spirit. For your lessons. For the good times. For the bad times. For the ups and downs. For the laughter. For the friendships. For the memories. You’ll always be my Southern Part of Heaven. Until we meet again, hark the sound.